So I've been finding myself in the same place out in K-Town every single day for the last two weeks--a surprising first for my usually attachment-free self. And no, I wasn't eating seasonal banchan over at Mapo nor getting my Oaxacan fill at Guelaguetza but instead...sipping on some fine-drawn brews at a Bier Garten. I remember being dumbfounded every time I passed by the Korean-German facade as I drove down Western. 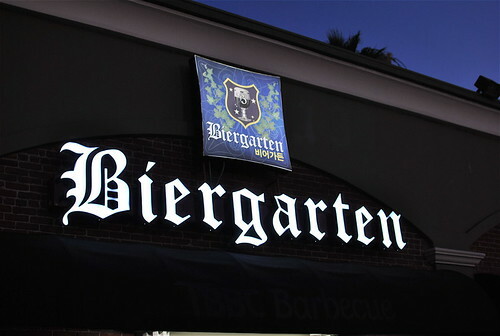 An actual German style Bier Garten in Koreatown? Naaah, it couldn't be.Well, it was. And apparently, its something that this part of L.A desperately needed. 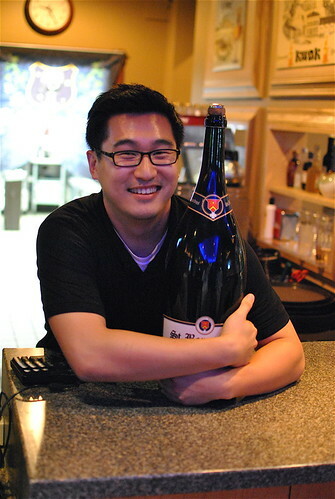 Bier Garten is the four month old project of Neil Kwon, a guy who really--really--likes beer. He happened to go to school right next to Pyramid brewery, a brewery known for their unfiltered, full flavored Hefeweizen's. He tells me it was love at first sip. And like any other lovestruck fool, he fell hard. He actually went backpacking through Europe for the sole reason tasting beer. "I had a chance to go to Hofbrau haus and the Chinese Gardens in Munich, the classic beer gardens." According to Kwon, "I was betting on that Koreatown is changing. More Korean Americans and non-Koreans are moving into the area. Koreatown is pretty exclusive by nature and I wanted to create a place where anyone and everyone who likes beer can enjoy." Well, he certainly did. At only four months old, Biergarten already holds over 24 international beers on tap and more than 4 readily available as bottles. 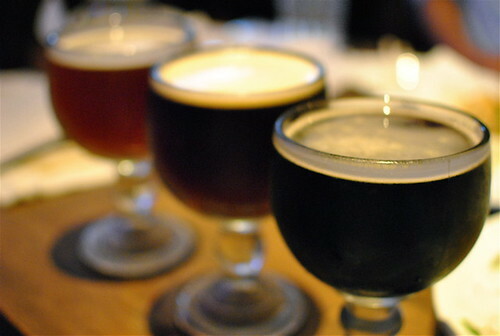 They range from an almost equal selection from the two beer powers of the world: Gernany and Belgium. And if you must know, the Kostrizer Schwarzbier, a minimal hopped German black lager with a faintly flowery aroma, and the house dark wheat Dunkelweiss are what most likely will always be in my frosted stein (pictured on header photo above). Not to say that I won't drink anything new that Neil gets in, which seems to be pretty freaking often. Last new beer I remember was a pretty damn impressive IPA from DogFish Head brewery. 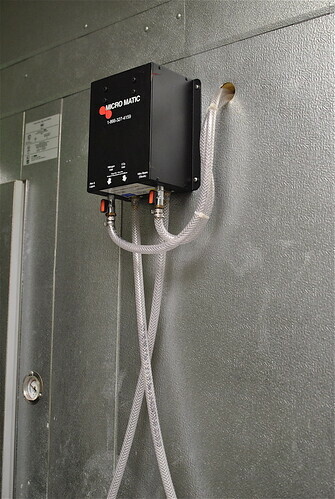 Maybe it has something to do with the Nitrogen Mixer that has a custom ratio for each classification of beer. Neil had it installed when he first bought the place, he would not have it any other way. But all the beer here somehow tastes crisper, cleaner and more refreshing. But I digress, its time to get back on the Glutster track....the full Korean-Mexican-German menu here. I'll start with the beer bite essential basics from both spectrum's first. 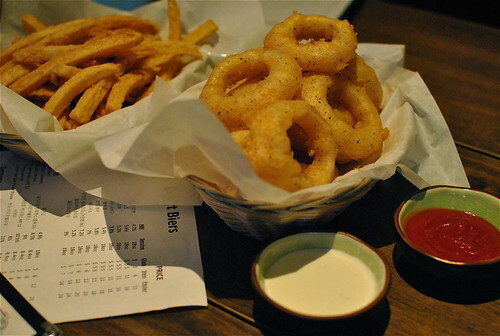 Pabst Onion Rings And Tempura Fries: Don't Even Trip! So I was a late 'bloomer' to the Onion Ring world but I came, and better late than never. The onion rings here are leavened with the one and only Pabst Blue Ribbon lager, aka "PBR" for all you fucken hipsters, ha ha. And each ring is a divine dinner-vention in itself. As crispy on the outside--moist on the inside--as a freshly fried Krispy Kreme donut, well...only savory and well seasoned. The tempura fries are good too if you swing that way. The best thing of all is that 4 beers later, both will be just as crispy and good, a fried rarity indeed. But, no matter what you get, ask for the house made Chipotle Ketchup and Jalapeño Mayo as dipping sauces....trust. The menu that ranges from a traditional grilled Wurst plate to quite the assortment of ultra traditional Korean-Japanese foods. I should mention that Neil's dad who works the back of the house kinda 'breathes' fish, he's been working at Japanese restaurants since he was in 6th grade. 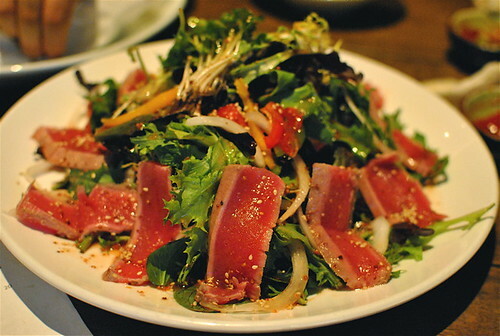 So you should not be offended when you see an ultra-fresh Seared Albacore Tuna Salad or Grilled Eel served with uncolored slivers of fresh Ginger on the menu. I've had both more than twice already and have noticed the vast improvement in each dish. 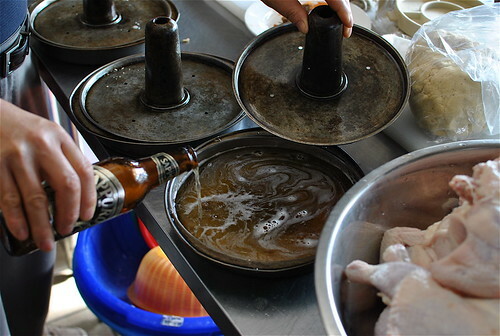 I managed to sneak into the kitchen last time and see the masterful technique behind BierGarten's enticing Drunken Chicken. 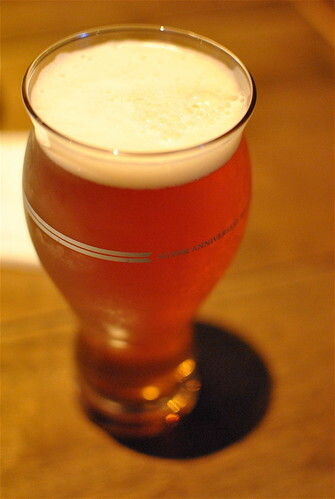 A full bird that is cooked from the inside out via the flavorful vapors of a mixture consisting of mostly some Oktoberfest Marzen, Sapporo and Asahi when I was there. 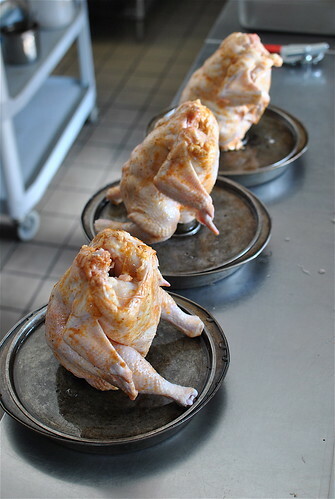 The juicy fowl is cut table side and served with a duo of mustard dipping sauces and a razor thin cabbage salad. Most of the fat seeps out the side of the bird during the cooking process and results in some surprisingly lean, moist flesh. 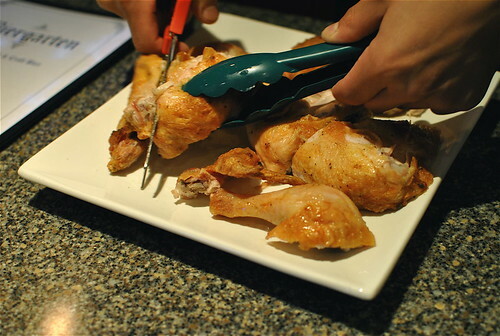 I've seen people eat almost one joyously whole chicken like if somehow was all dark meat or something. The Kalbi is tender, the spicy pork rich and not too far from its Al Pastor brother from another mother. But my favorite is and shall always be the spicy tofu. The spicy sauce somehow adheres to the coarse grained tortilla just like the adobo does from the traditional al pastor ones. And yes, it has made me swoon one a many times. The menu is still in its rough draft, but thanks to the selfless efforts Eddie Hah of 8 oz Burger and I, it is only getting better and better. Expect things like American style Corn Dogs with Korean Seafood Sausage and a Wasabi Mayo and Sliders made out of traditional Korean seasoned ground beef and pickles. 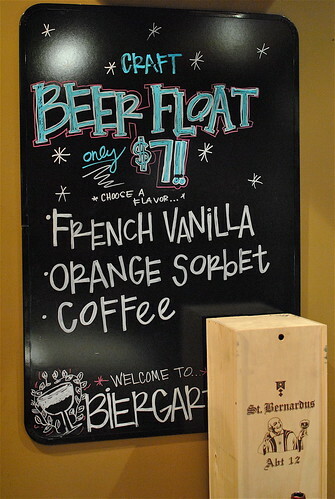 And for dessert, there are glorious beer floats made with the most O.G of ice creams: Thrifty Brand. Don't deny the fact that its bomb, we all grew up with it. If you're really down, ask for a Makgeolli float. The latest and greatest of contemporary Korean food fusion that Pulque-like unfiltered sweet, sparkling rice wine with a fat scoop of citrusy sherbert. Now, if you excuse me I have to roll out to make their Pabst Pitcher 1¢ Happy Hour! Bawk bawk bawk! Love the pic of the chickens. so glad this place is getting the notice it deserves. I love the ambiance, service was excellant and I liked that the food was unique (the peanut butter sliders were surprisingly delicious and I enjoyed the large plate of fried gizzards). You post reminds me that I need the head back! i've never heard of this place! seriously reading this has my stomach grumbling i need me some beer and onion rings then some tacos for dessert! I've heard about this place but haven't been able to try it yet. I'd go just to try that chicken. 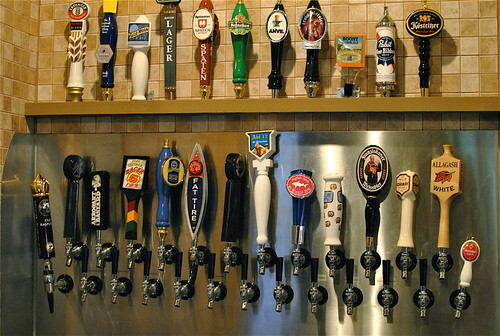 Also, I'm very glad to see the craft beer movement continue to expand - it's about time! Darin: seriously man...its about DAMN time beer gets the same amount of respect that other drinks get! I can't believe this place flew under my nose! I'm so checking it out. 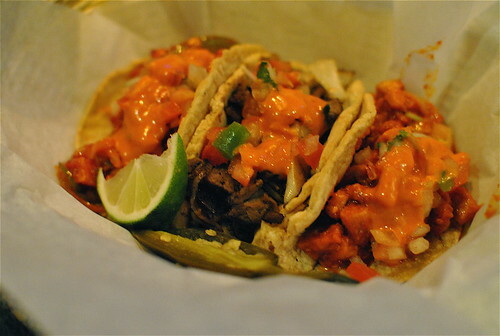 I'm already hankering for galbi tacos and beer :p ... Nice post! Went here on Friday night based on this post... It's awesome. Thanks for the rec. Dude when is this PBR happy hour I keep hearing about? Is it every day before 8? Because I really wanna get in on that. Just get in and ask for it! Luv this place and love your pics.